Growing up in the family business, Country Choice, in Nenagh, Co. Tipperary, Eliza and Evie Ward worked on the shop floor, “potting jams, labelling products, talking to customers, clearing tables.” It wasn’t long before our duo would branch out to create their own line of goodies under the ‘Nutshed’ name. An entrepreneurial spirit was ingrained early on. “When Evie was about 10 my dad gifted her with Nigella Lawson’s cookbook ‘How to Be a Domestic Goddess’. She would make loads of brownies, though she had no concept of how many she needed, but she was getting paid for it. I’d say they were the most expensive brownies in the whole of Tipperary”, Eliza recalls with a laugh. A festival street food stall emerged from a project Eliza completed for her course in Culinary Arts at Cork Institute of Technology. She started with an umbrella, a grill, a table and a van rented from her dad with her sister Evie joining the crew later on. For 10 years they spent summers on the road taking in festivals like Bloom in the Park and Electric Picnic and taking over the latter’s Global Green food concept for five of those years. “We were like Duffy’s Circus,” Eliza jokes. As they honed their offering, their business emerged into “a more grown-up business” with staff and a production facility, and they’ve had to revise their ways of working to make sure everything runs efficiently. The sisters have fallen naturally into specific roles. 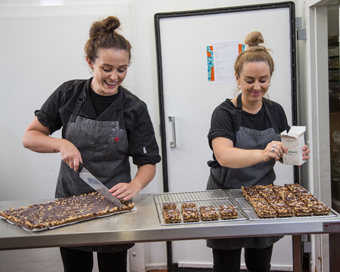 Evie “shines” in the kitchen, recipe testing, monitoring production, and dealing with stockists, while Eliza takes on more of the operational responsibilities. Both sisters share a vision for branding. Seeking a solution to their energy dilemma, Evie began to experiment with nuts, seeds and wholefoods to make healthy snacks. Her first creation was hemp and goji “raw balls”. The raw balls took off, boosted by a strong Instagram following. But it was tough: Evie was working off-hours in the Country Choice kitchen; starting at 7 pm and working into the early hours to meet demand. Eliza wanted to help, telling her sister: “You can’t keep working the way you are. Let’s fine tune this.” She began planning a production unit. It took an entire year of grant and loan applications, drawing floor plans, and buying equipment before they moved into their production unit in August 2017. Eliza admits the process was daunting and that “it nearly killed us”. Products, including peanut butter, are available in Sprout salad bars, from Avoca, Fallon & Byrne, and independent shops, with a Shopify account coming soon. Eliza says the food business is in their blood. “I don’t think there was ever going to be any other career for either of us”.